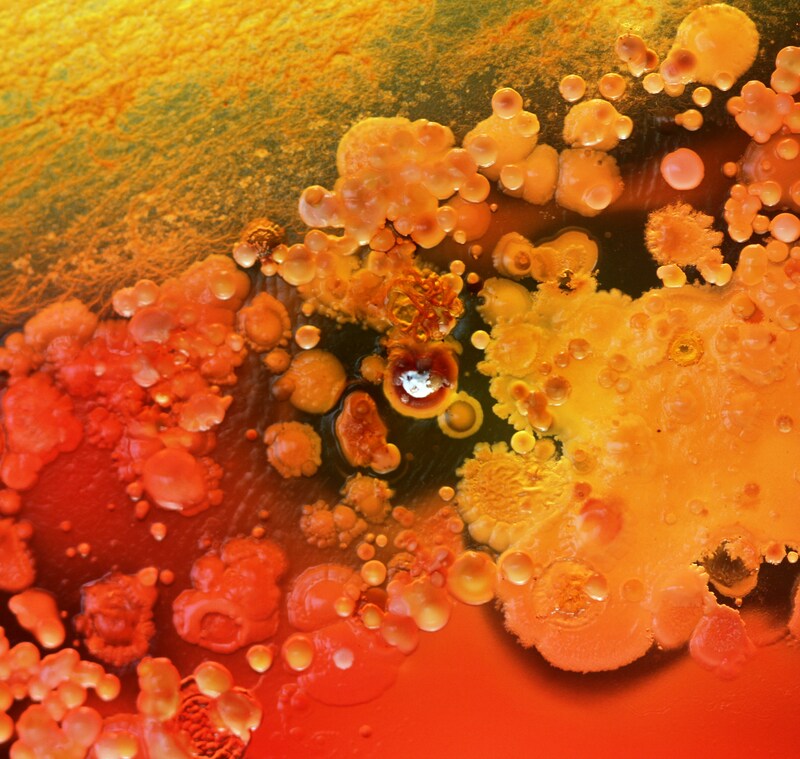 Some more experiments with crystalization processes and dead bees. 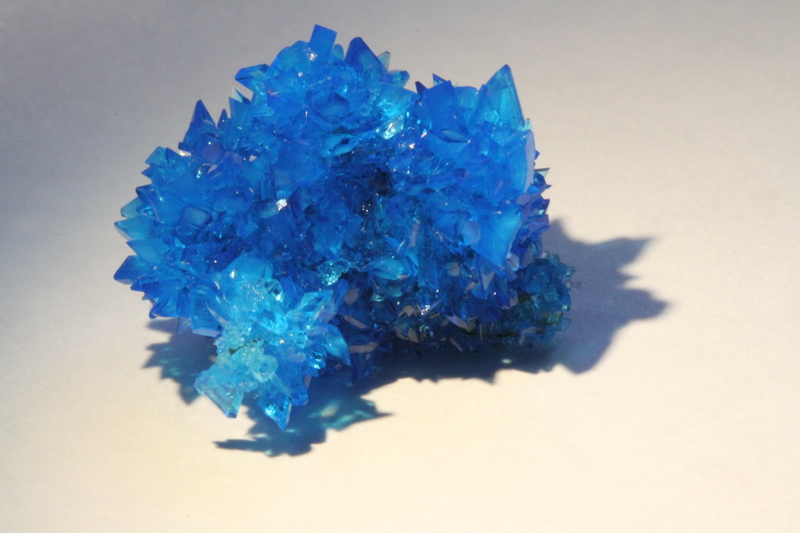 This time sulphur. 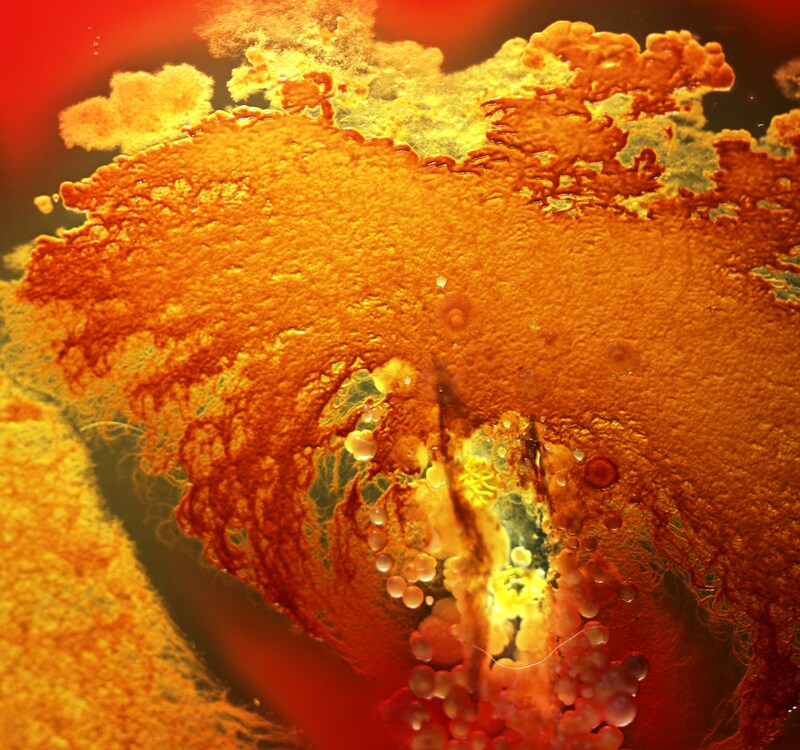 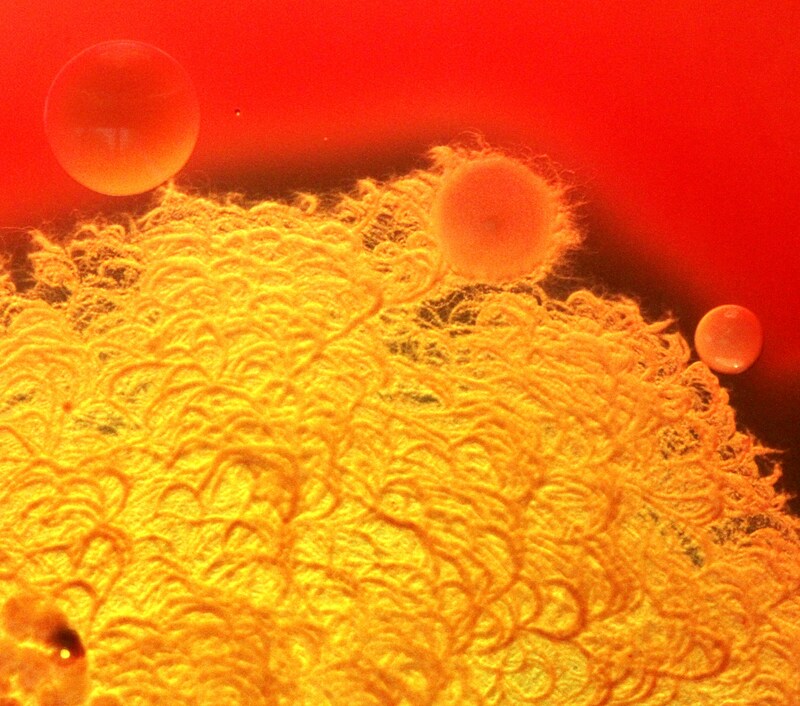 Mycobacteria are an important group of bacteria which includes pathogens known to cause serious diseases in humans, including tuberculosis (Mycobacterium tuberculosis) and leprosy (Mycobacterium leprae). 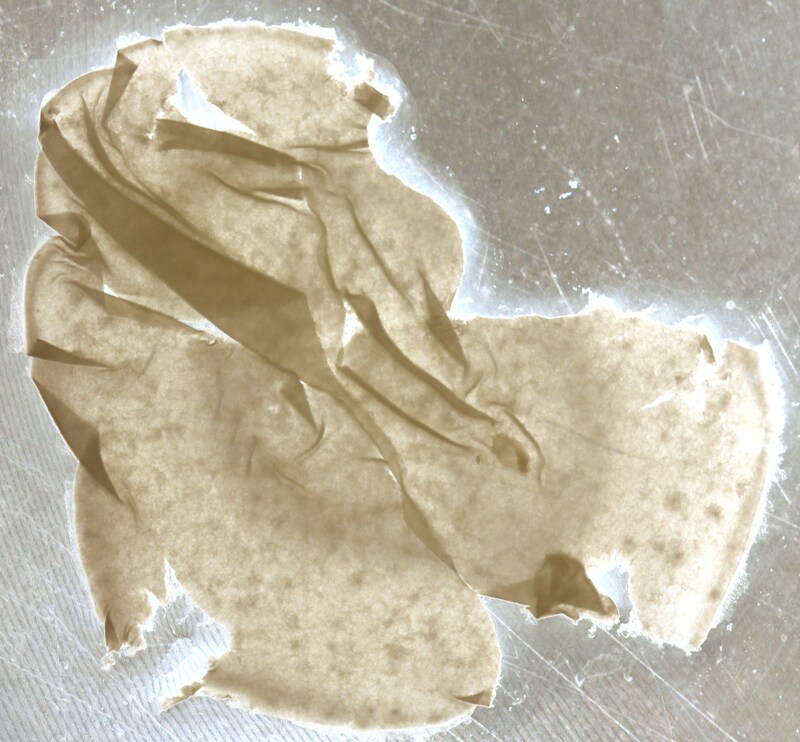 All members of this group have an unusual, waxy coating which makes them impervious to traditional staining techniques. 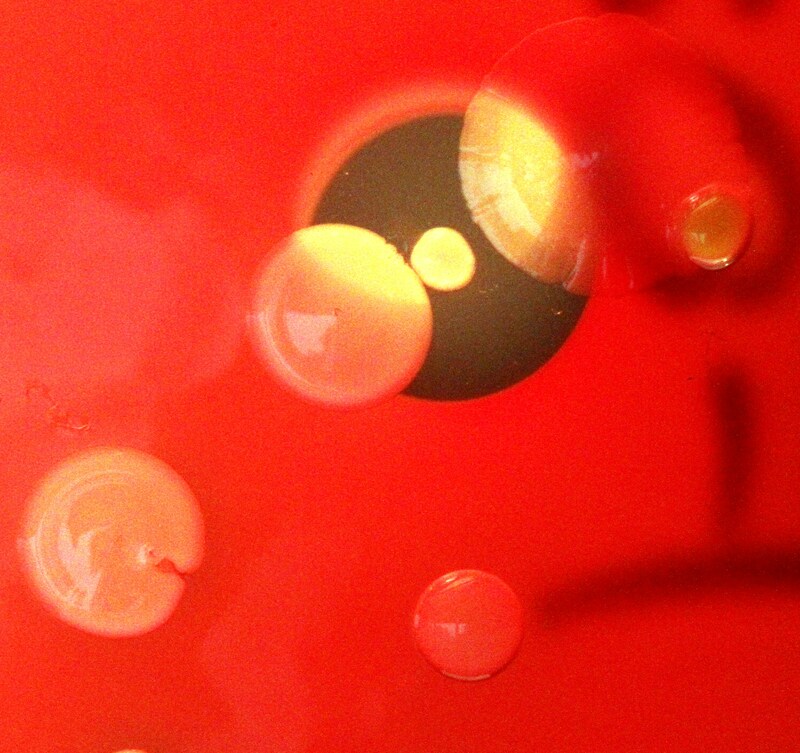 Moreover, this characteristic cell wall, which is thick, hydrophobic, and also waxy in nature, gives this group of bacteria many characteristics that resist medical treatment. 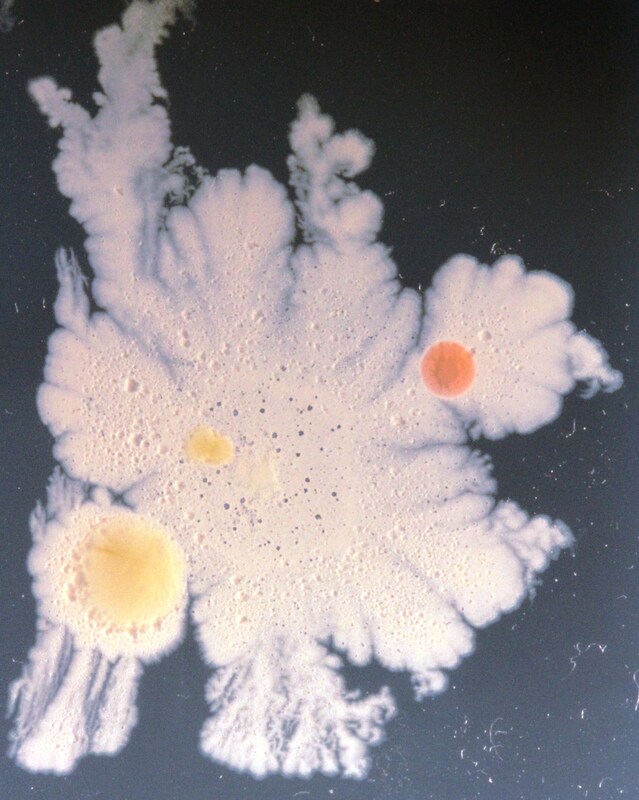 The mycobacteria resist staining by ordinary methods, such as the Gram stain, because of this waxy layer. 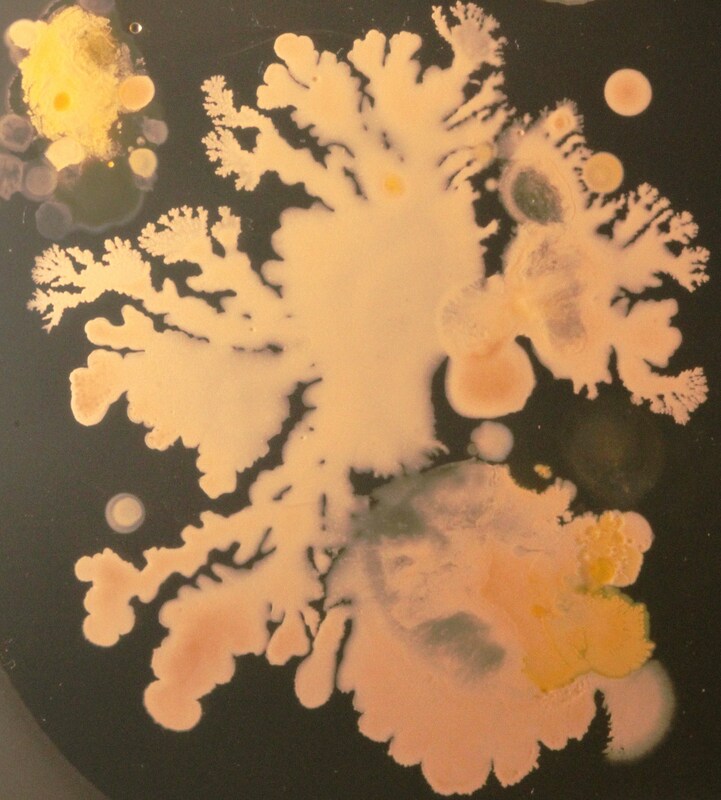 However, the Ziehl–Neelsen stain, also known as the acid-fast stain, is a specially developed stain that can be used on these bacteria. 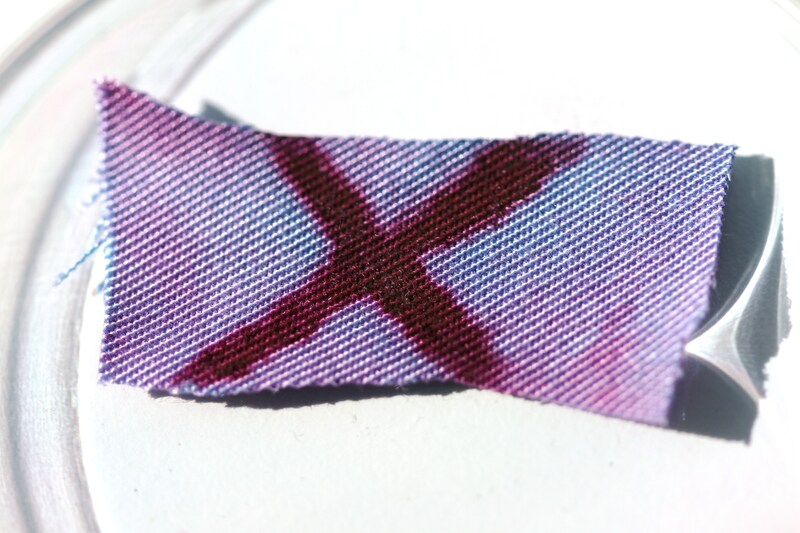 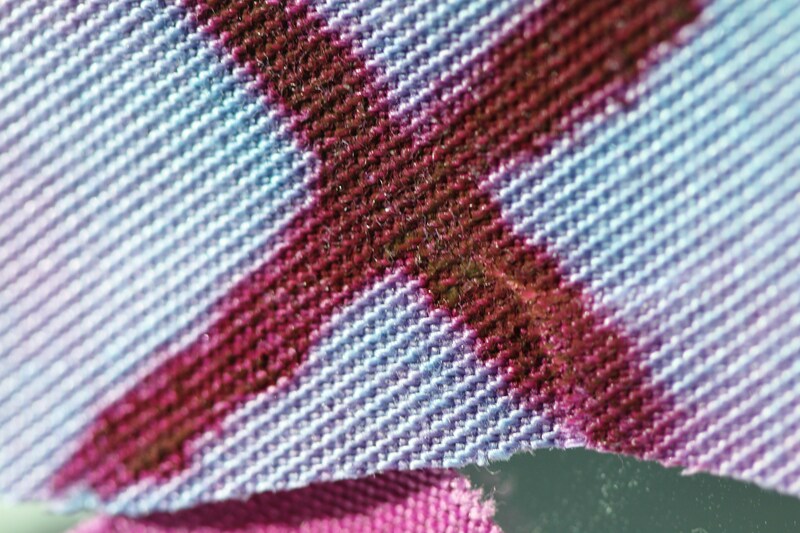 Here I have used this stain to produce a fabric design on a textile inoculated with a “cross” of Mycobacterium. 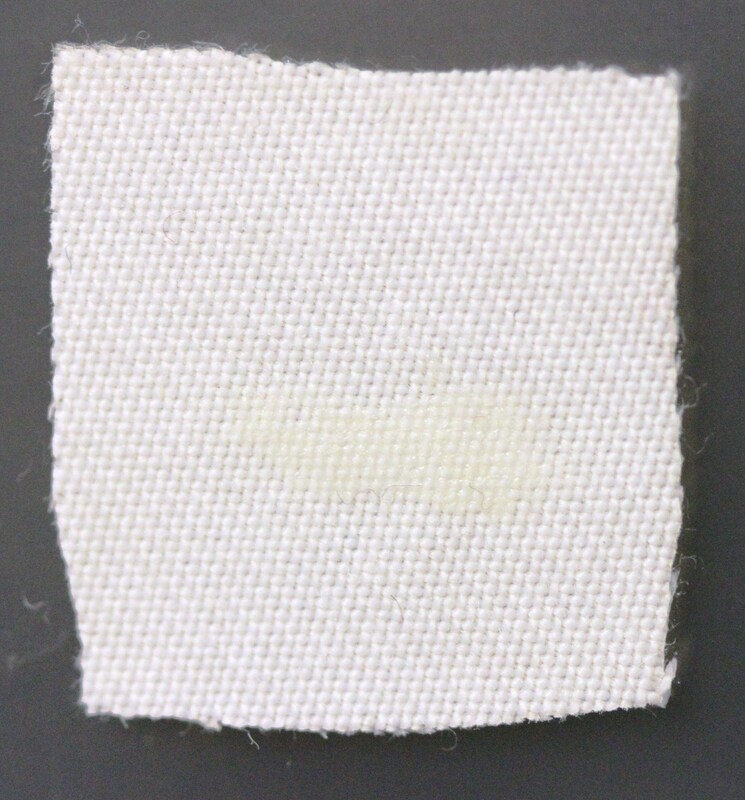 The first stain component carbol fuchsin stains both the bacteria and material but when this is destained with acid-alcohol, the textile loses the dye but the acid-fast bacteria, because of their thick and waxy lipid layer retain the first red dye. 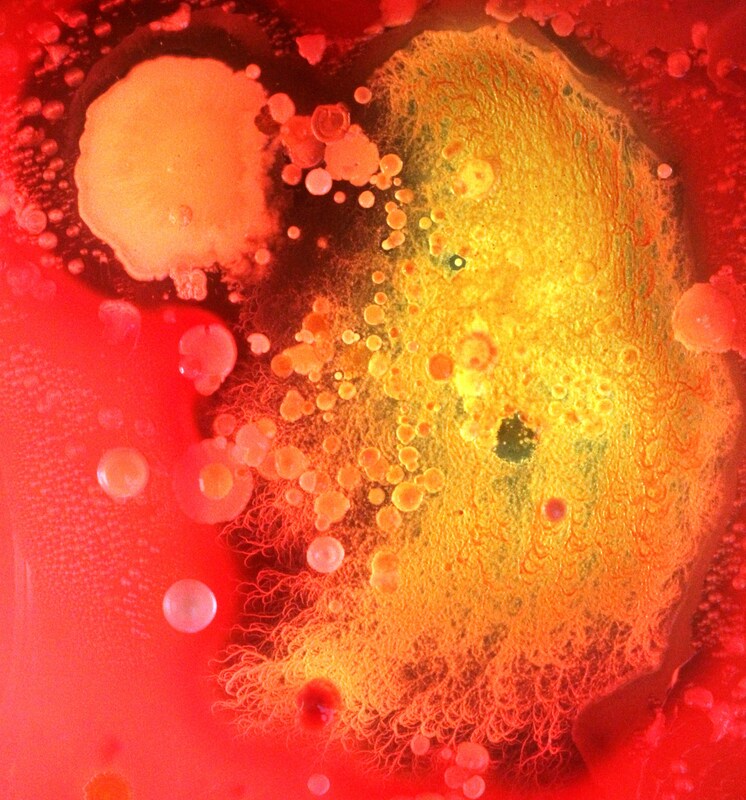 When the counter stain is applied, the non-acid-fast material stains blue and the acid-fast bacteria retain the carbol fuchsin and appear red. 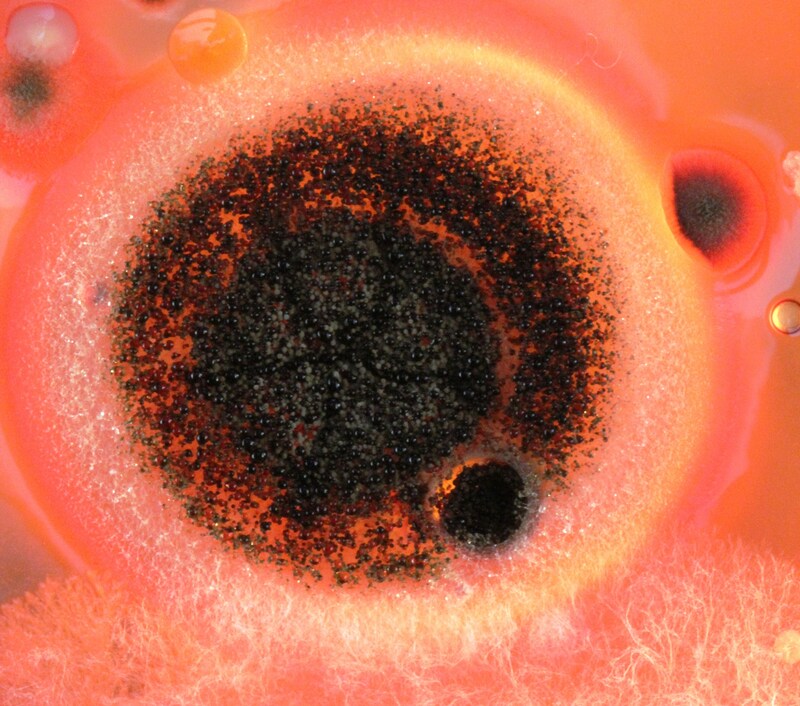 Clock Fungus. 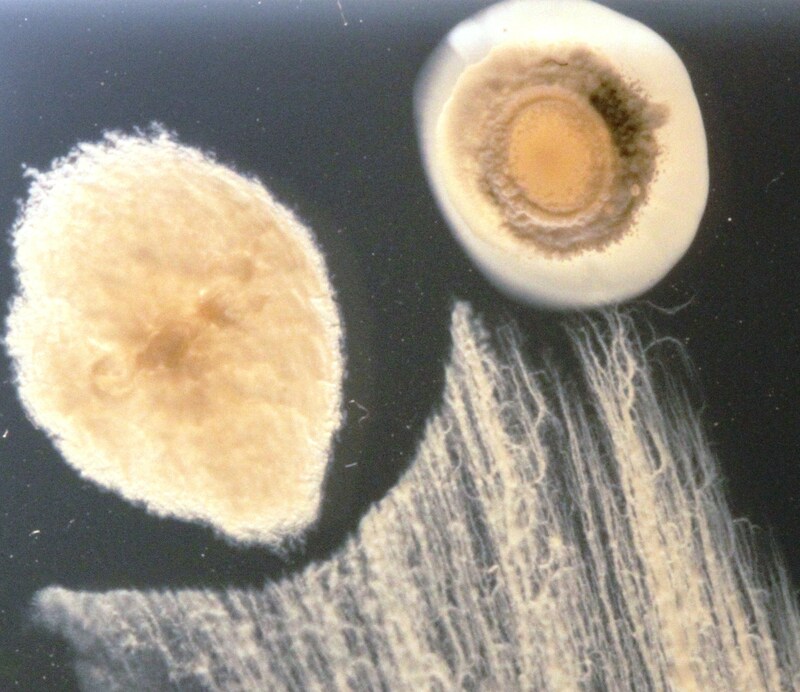 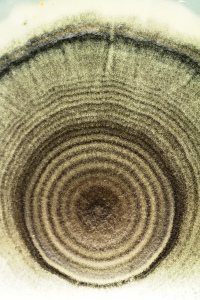 An unidentified mould that has a biological clock and much like the growth rings on a tree, can act as a clock. 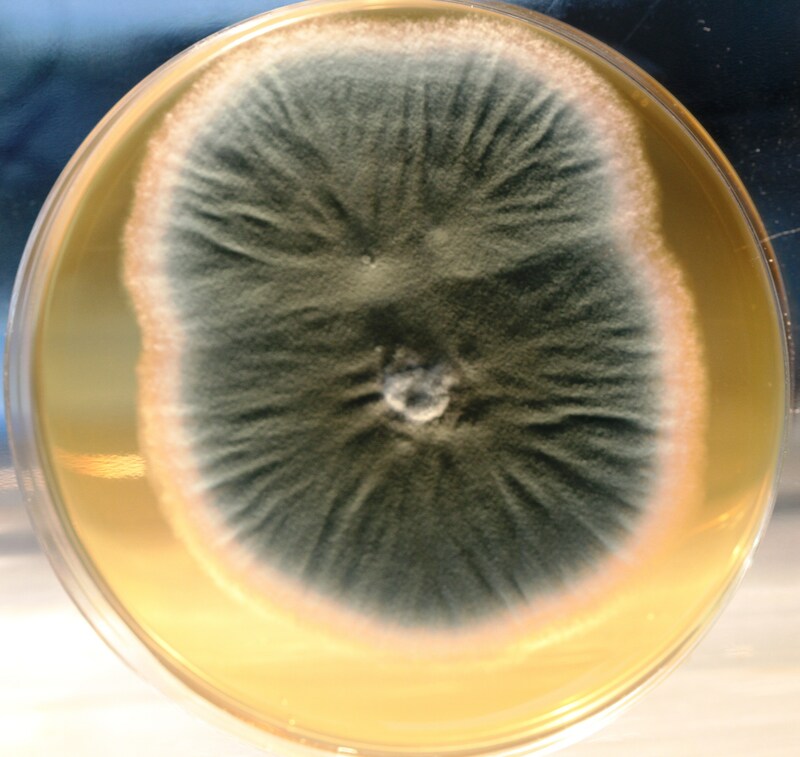 Penicillium camembertii. 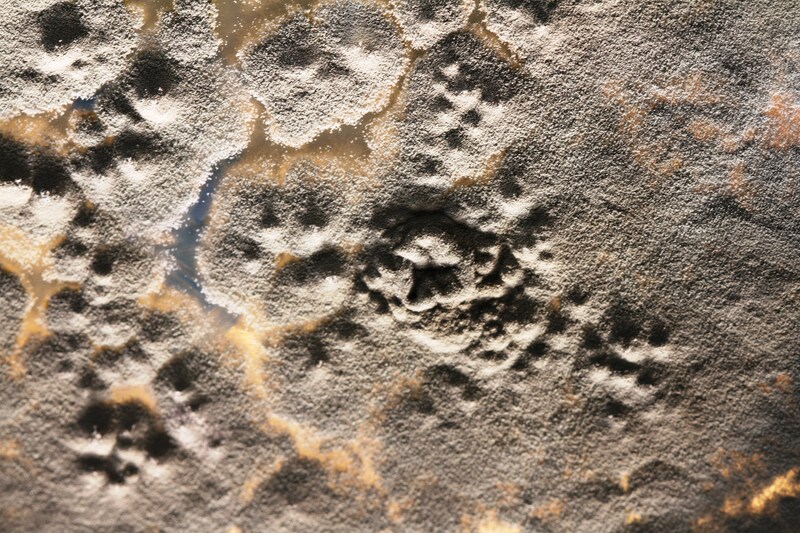 Isolated from Camembert. 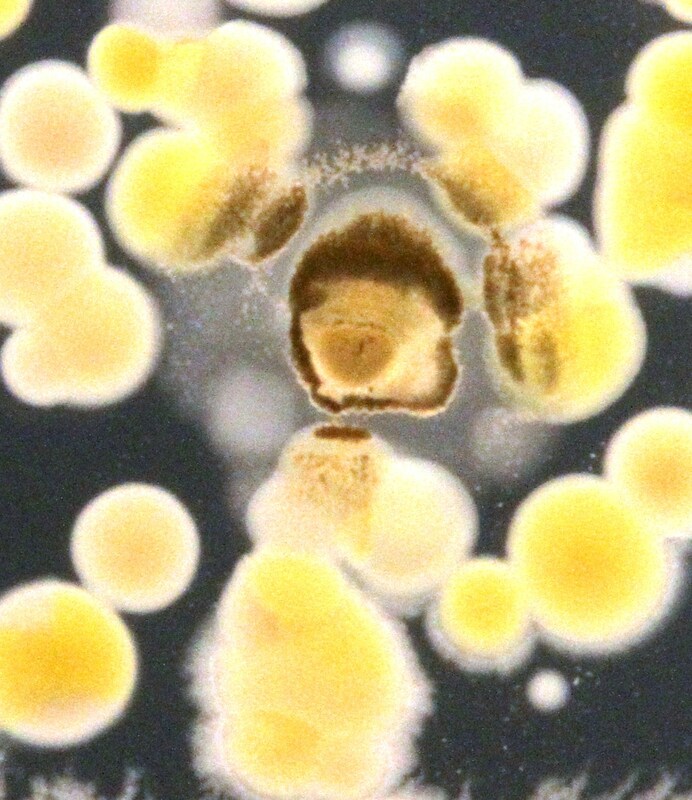 Forms a dense and lush mat when grown on milk. 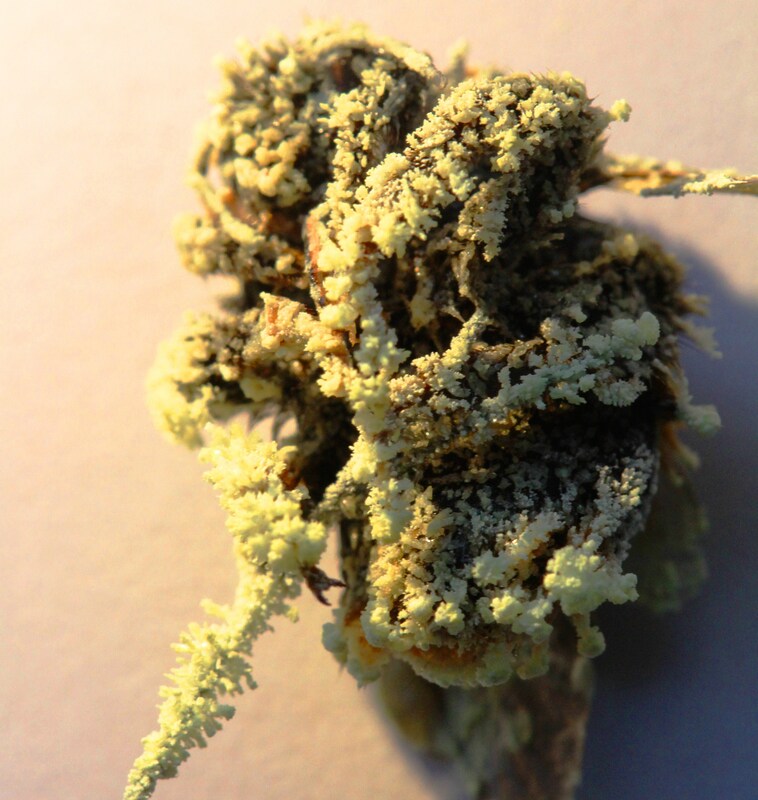 Could be used in MycoCouture and would produce a fabulous coat. 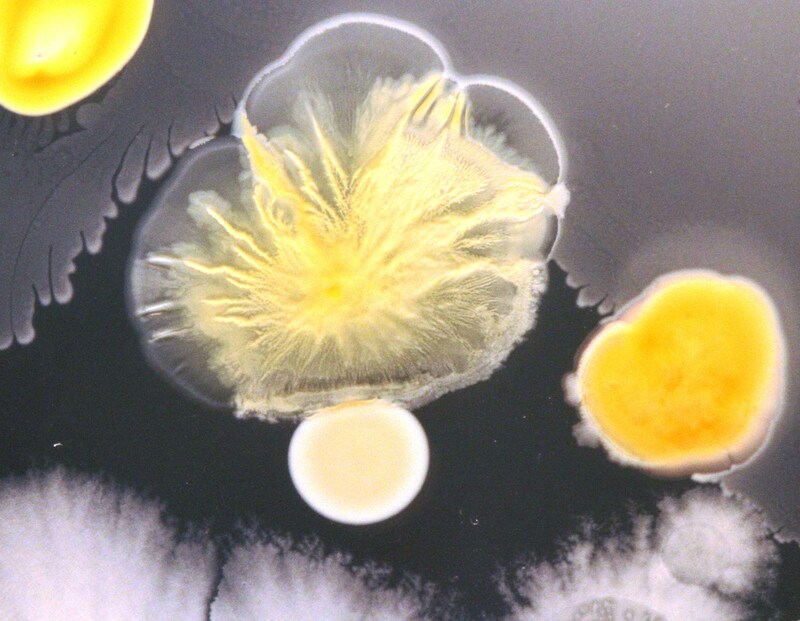 Penicillium camembertii. 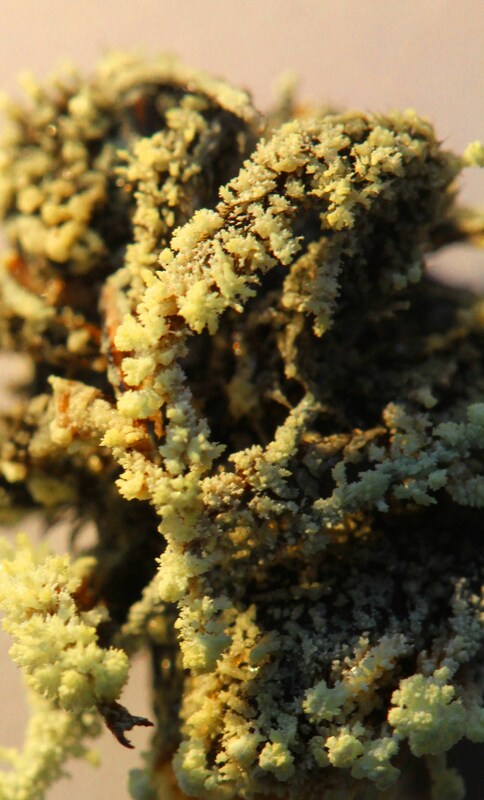 Isolated from Brie. 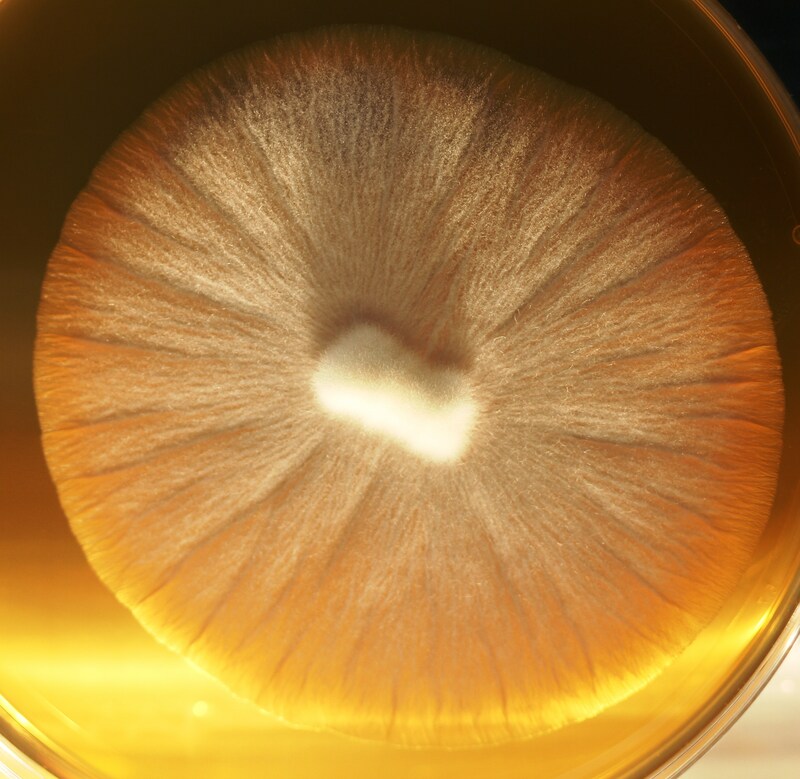 Forms a dense and lush mat when grown on milk. 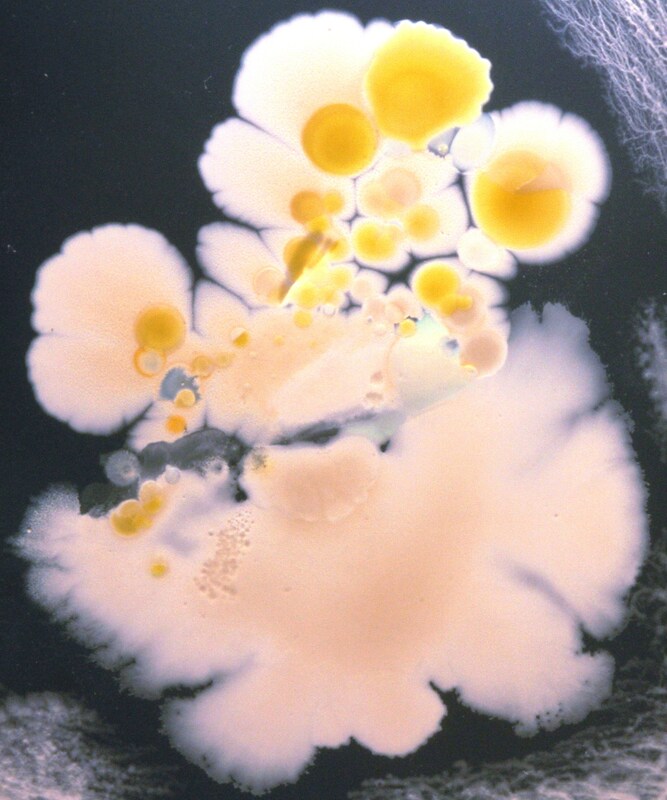 Could be used in MycoCouture and would produce a fabulous coat. 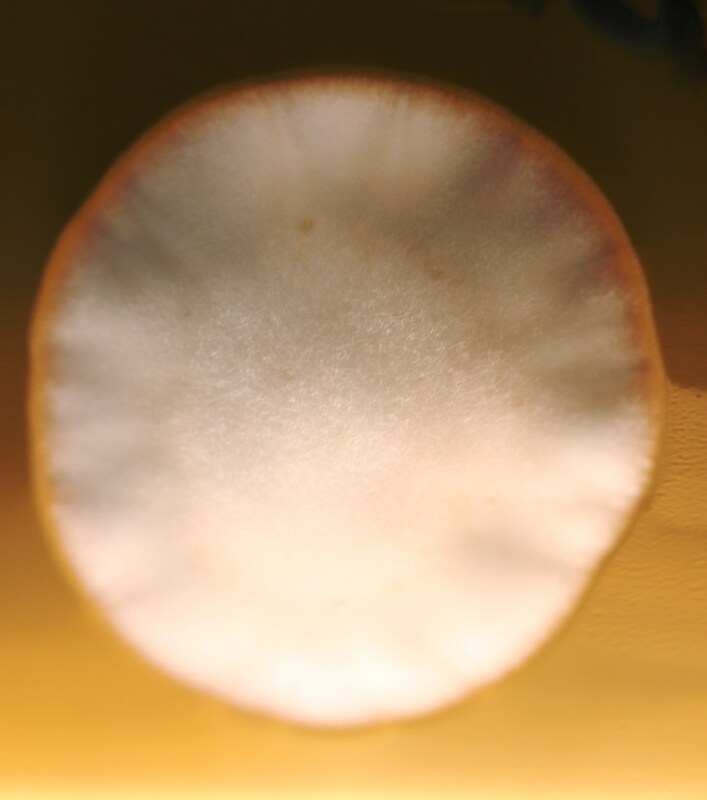 Panellus stipticus. 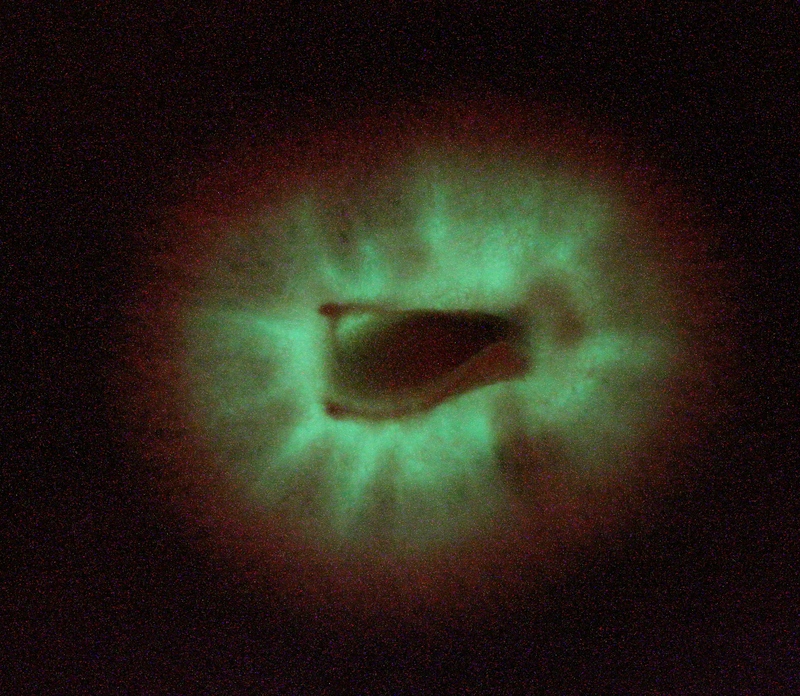 A bioluminescent fungus that emits a green light. 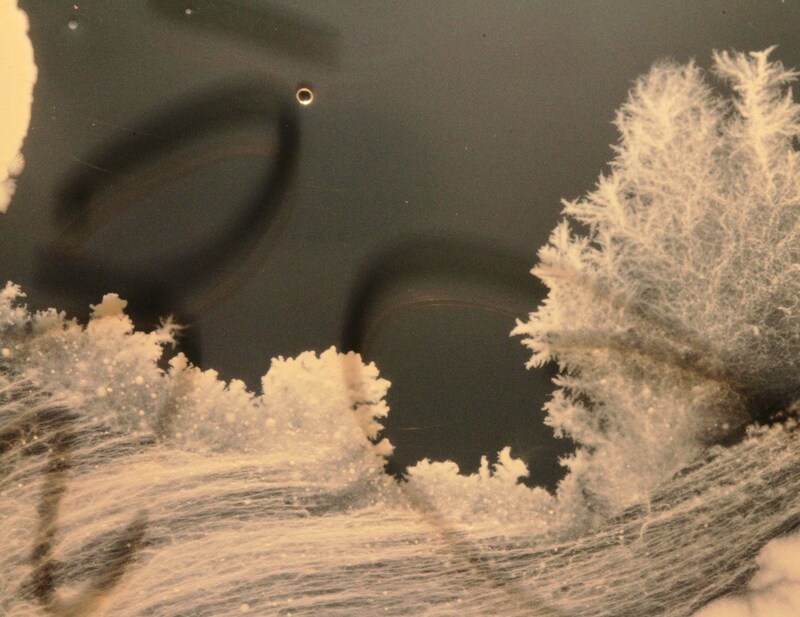 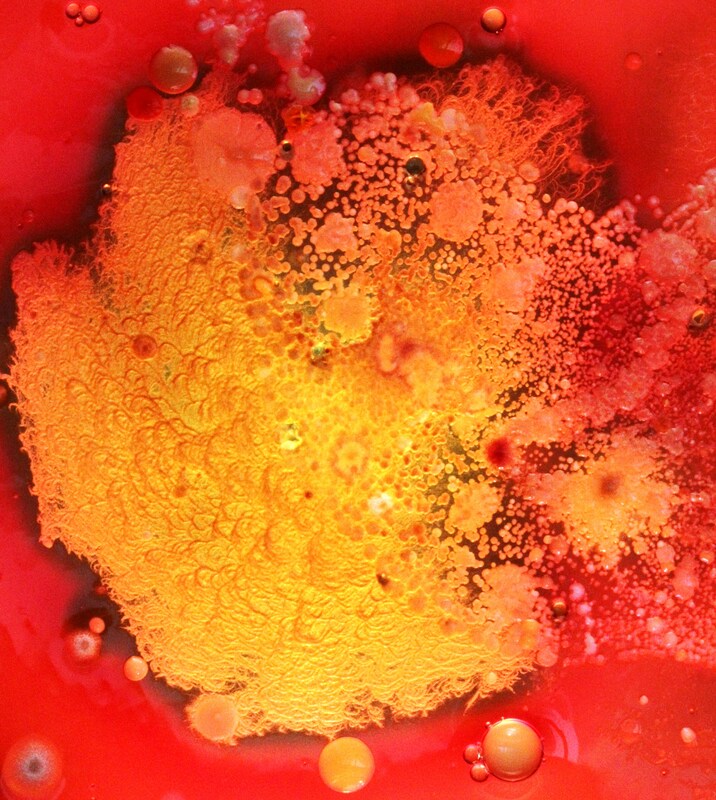 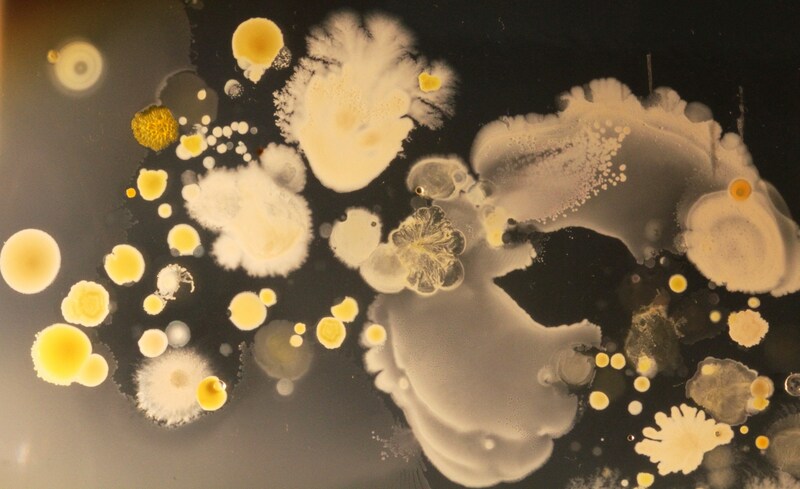 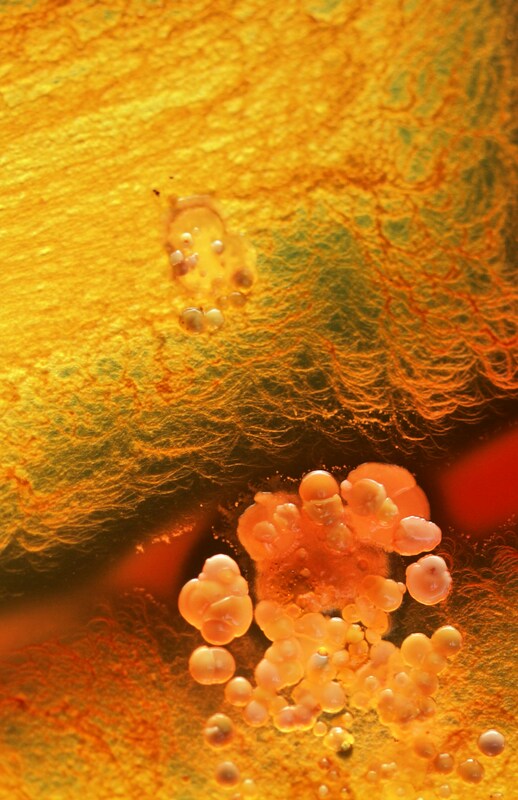 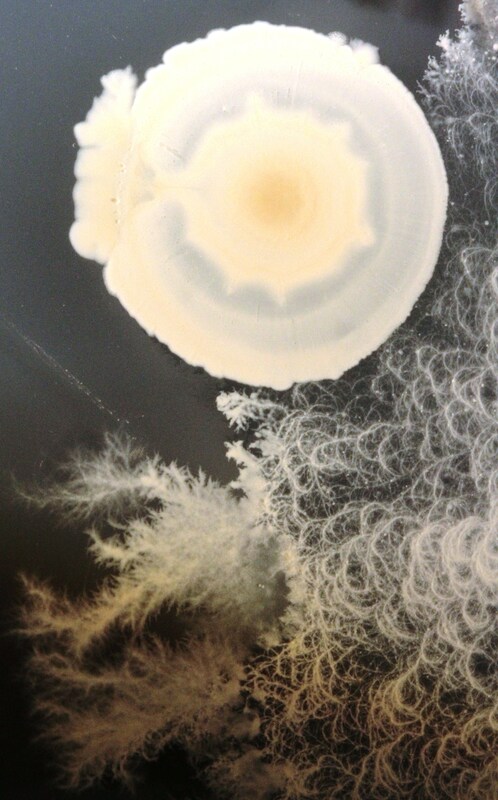 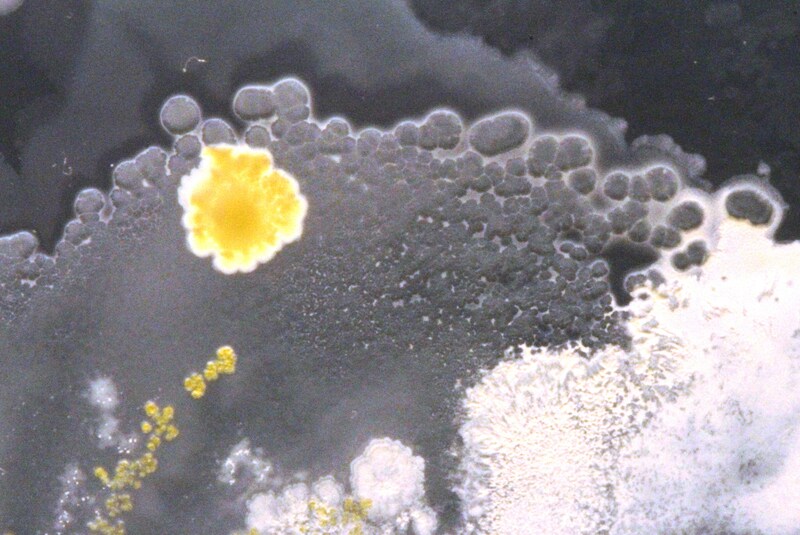 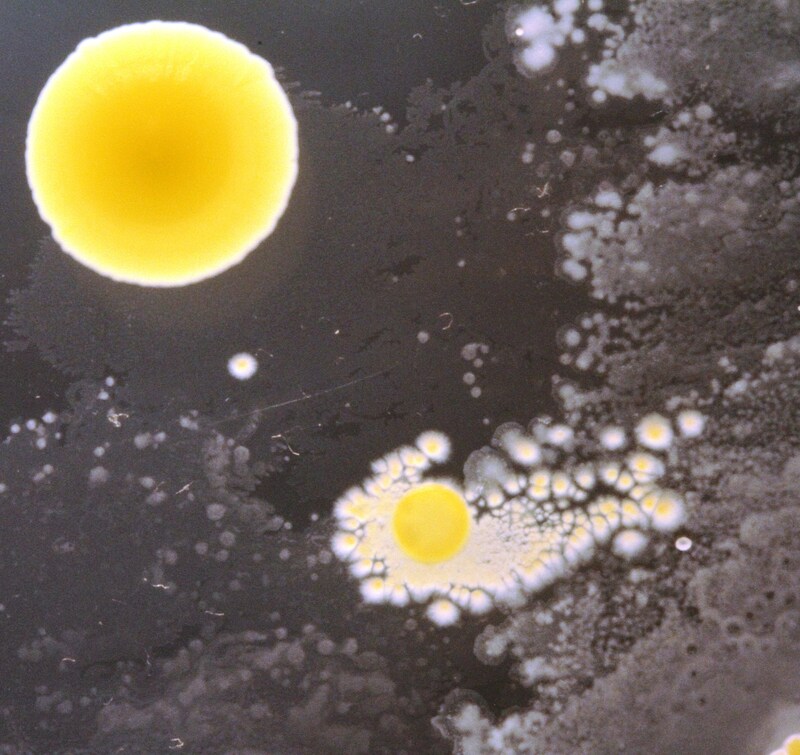 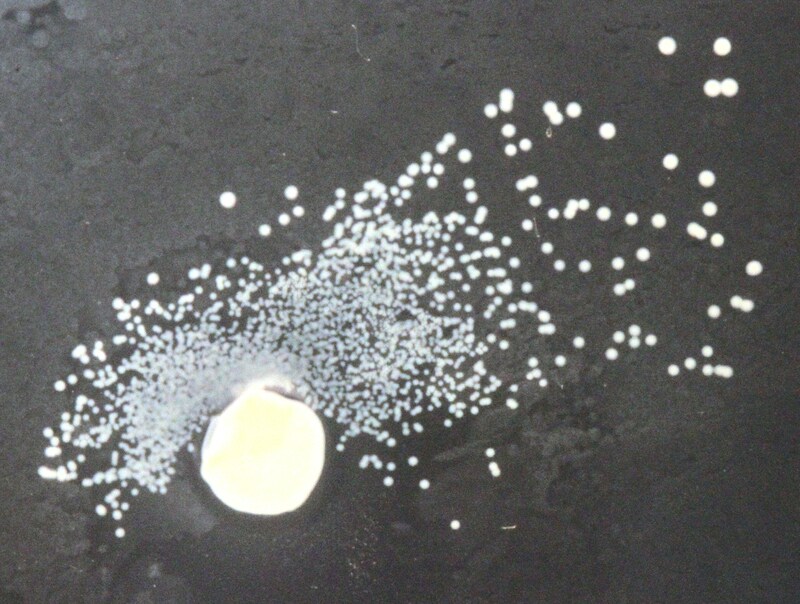 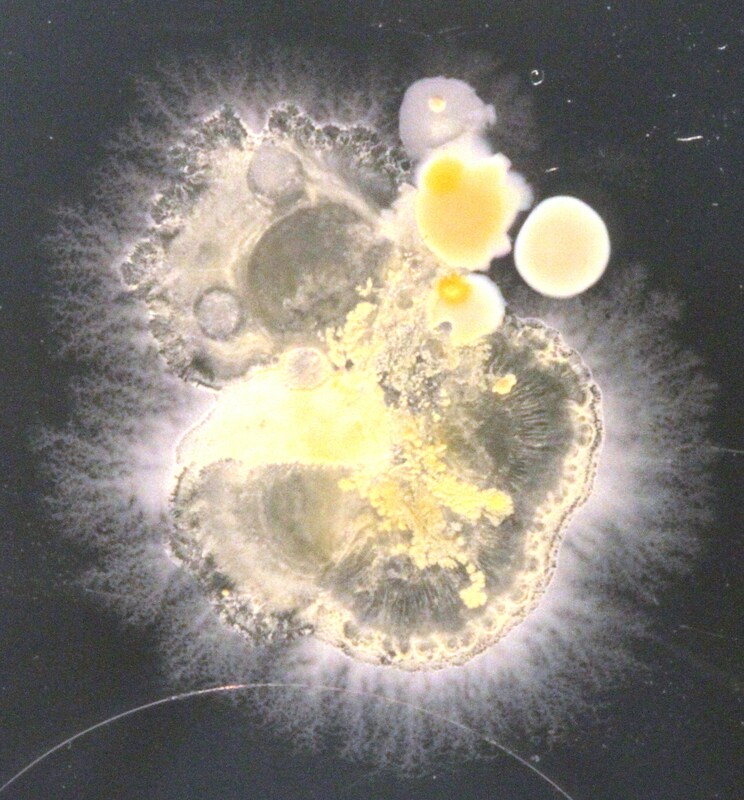 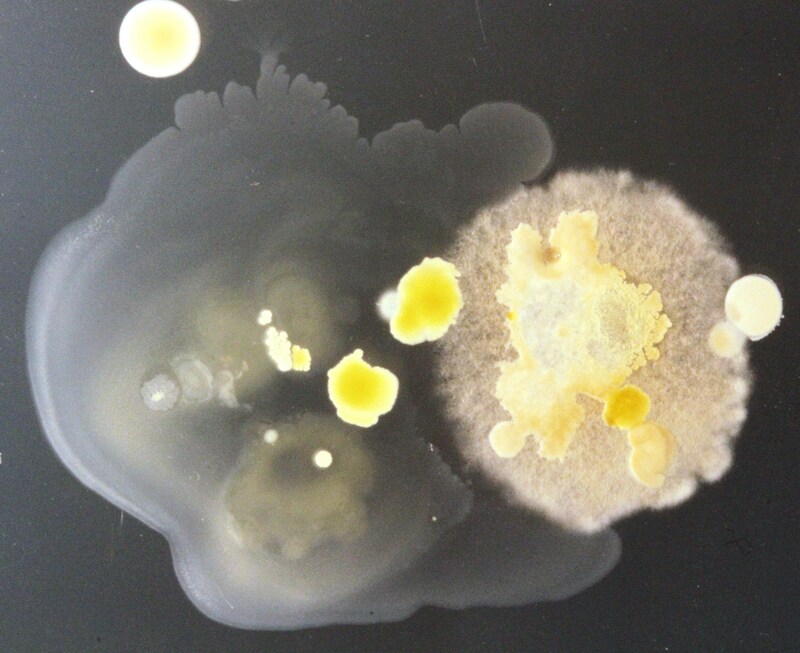 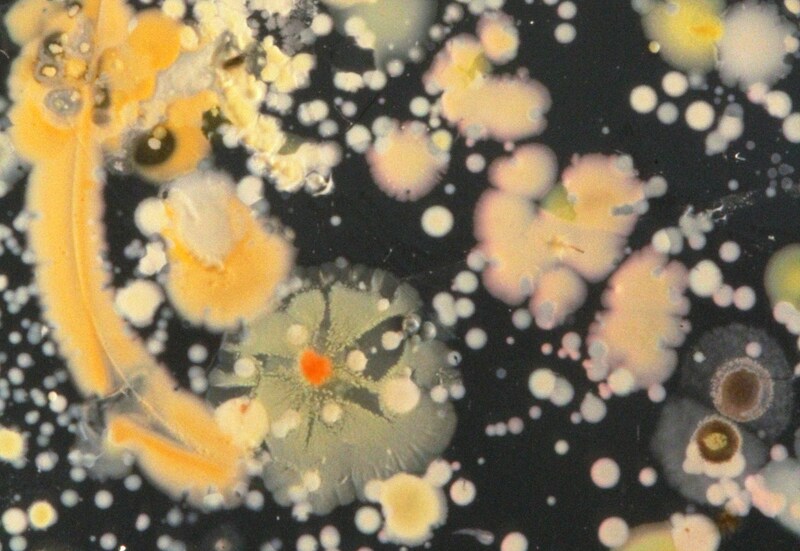 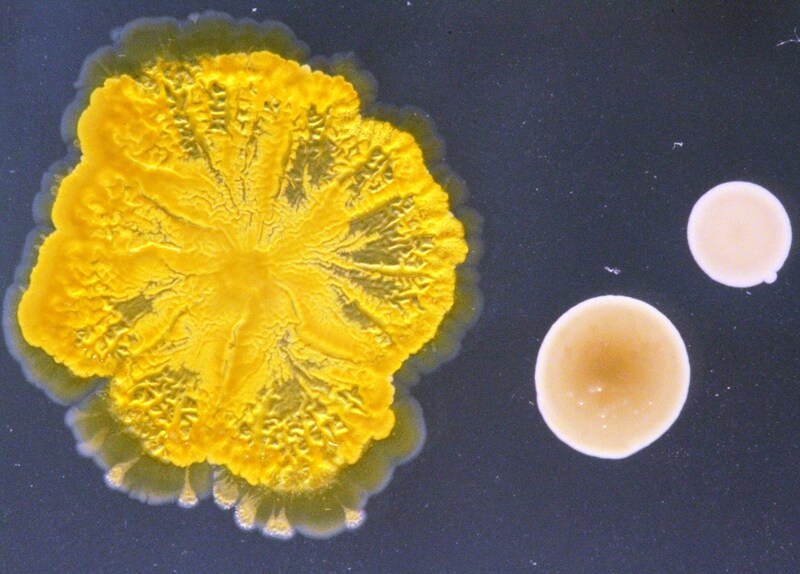 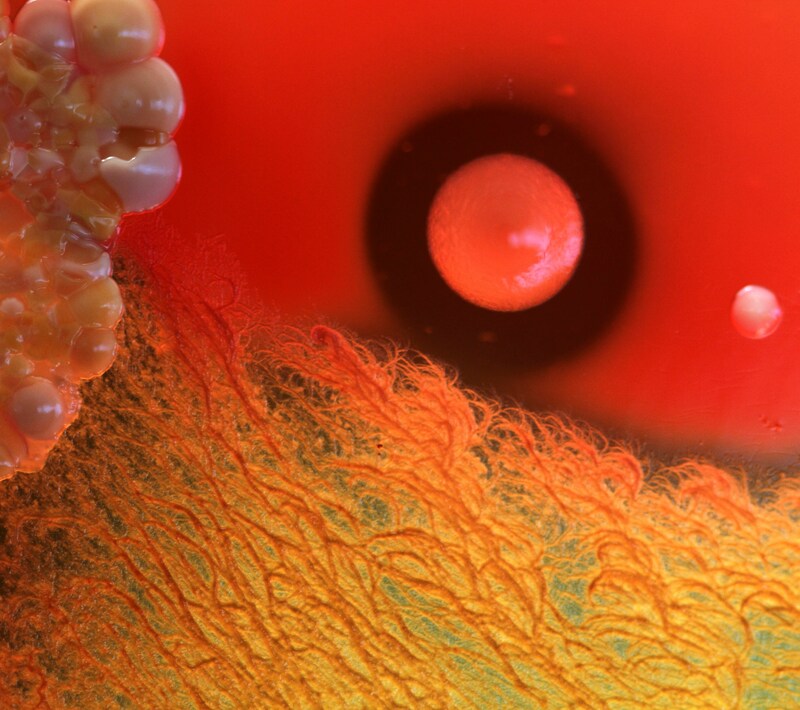 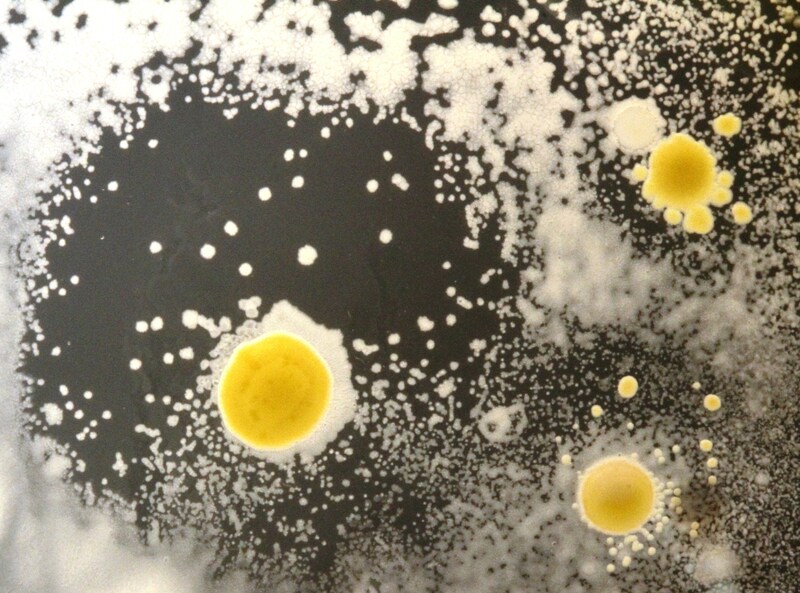 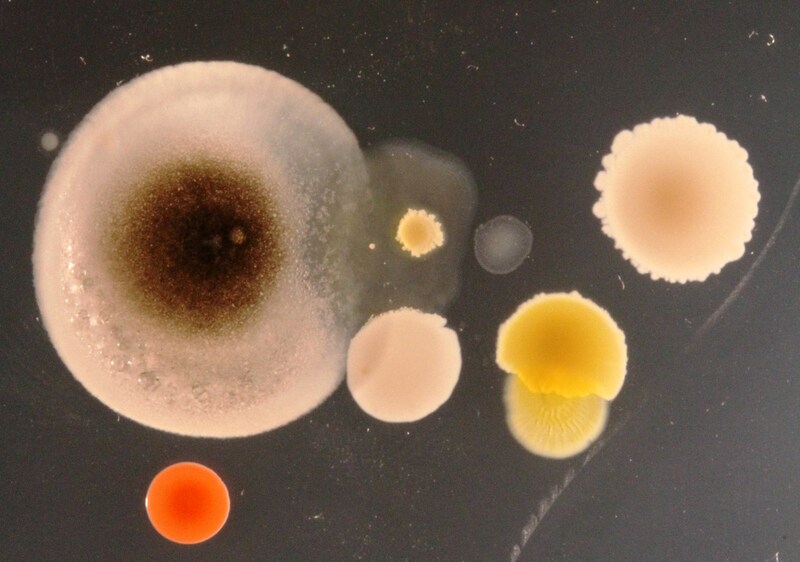 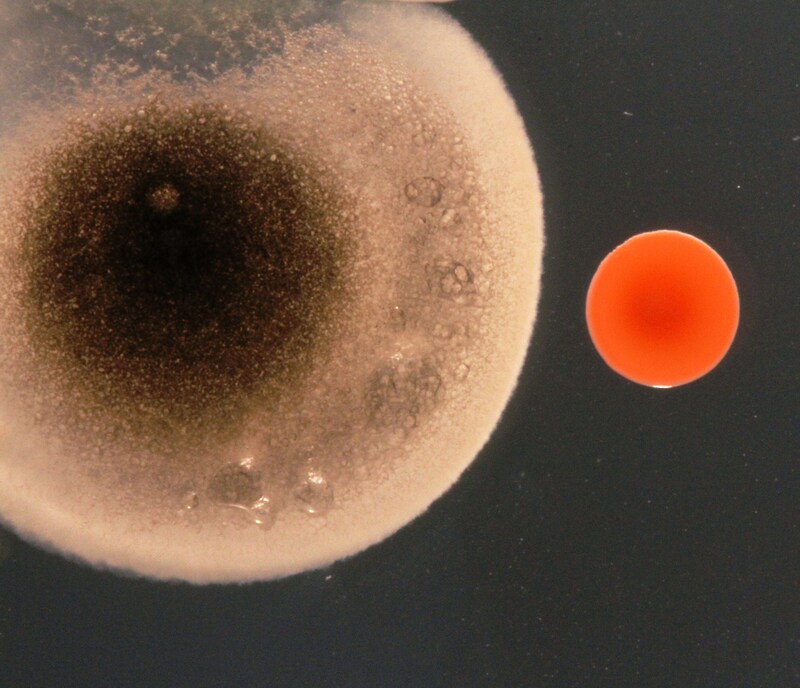 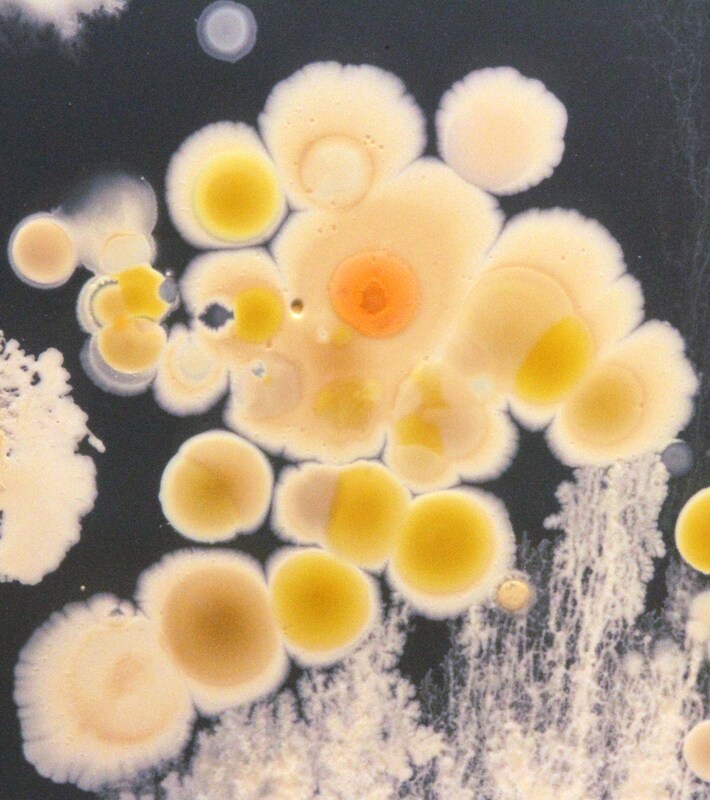 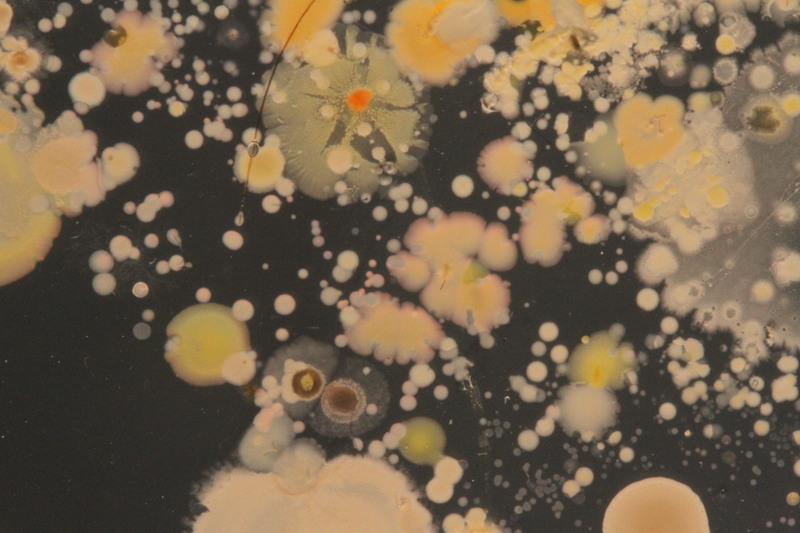 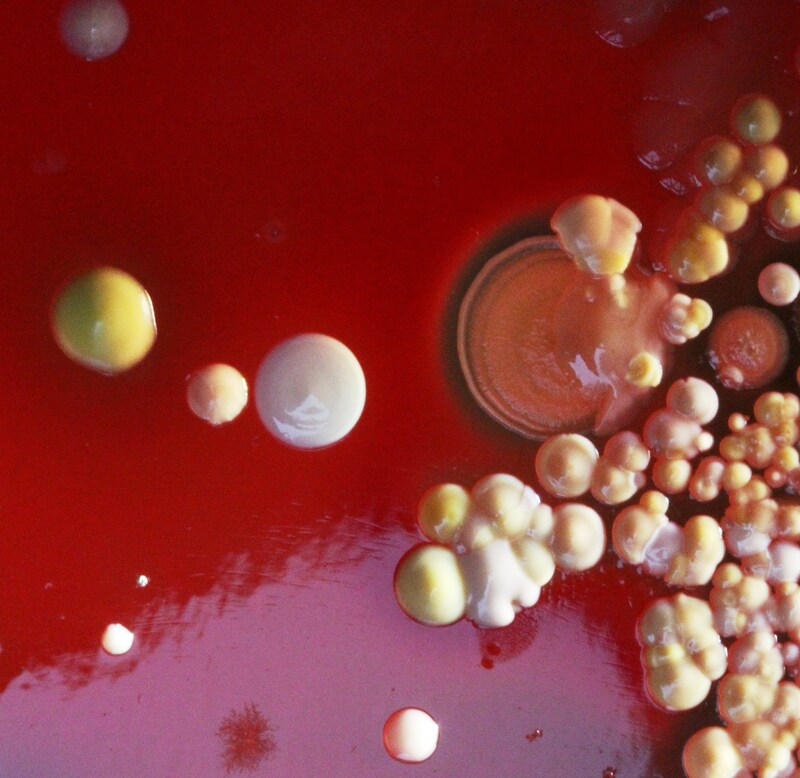 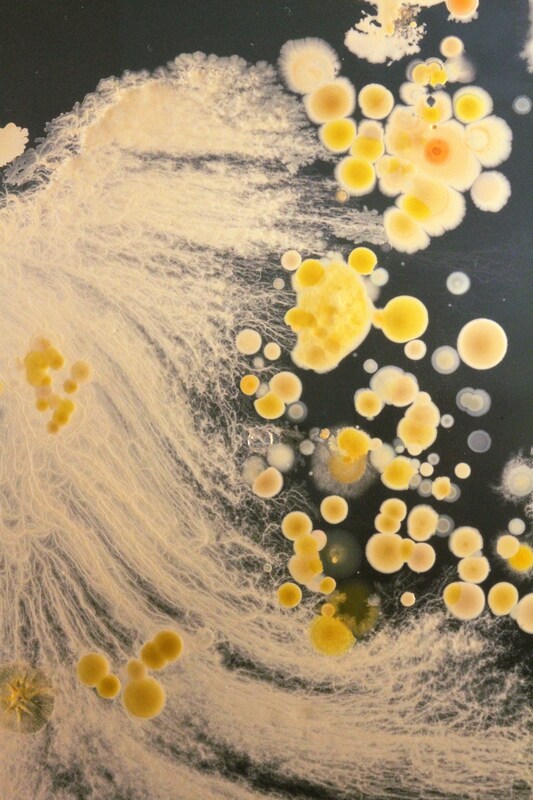 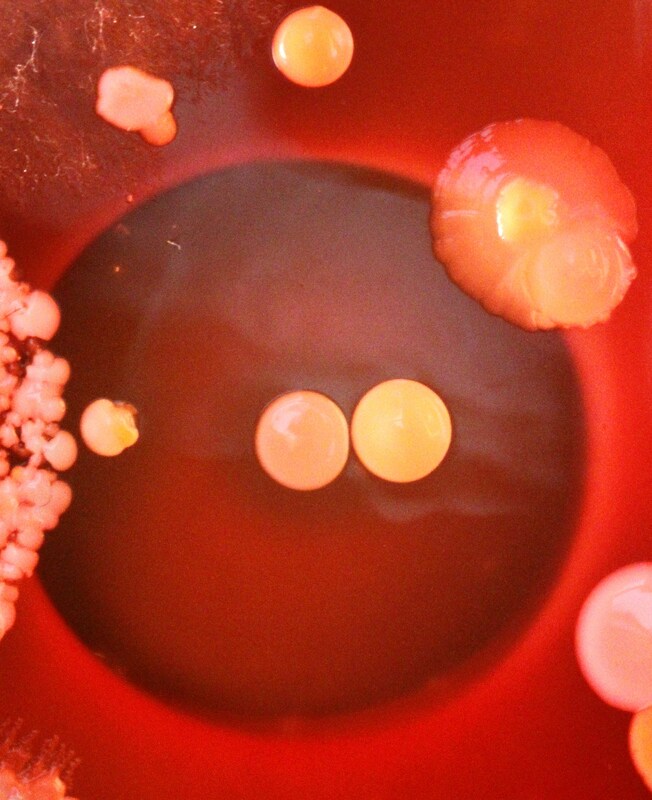 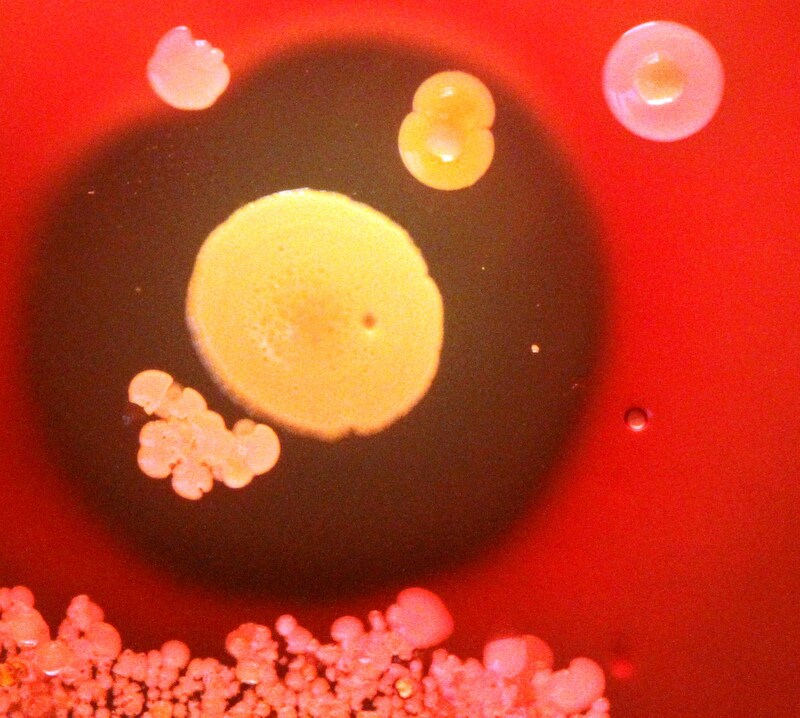 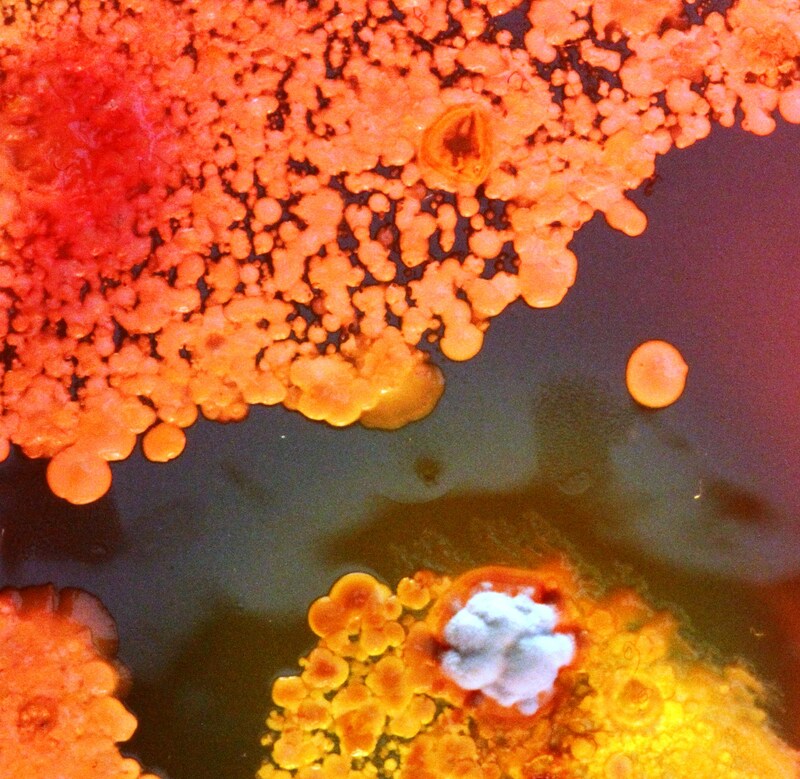 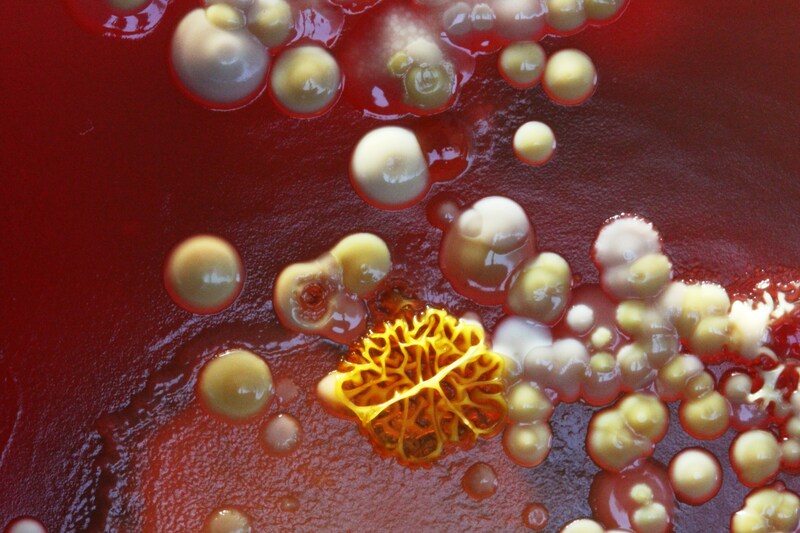 C-MOULD is a unique collection of microorganisms for use in art and design. 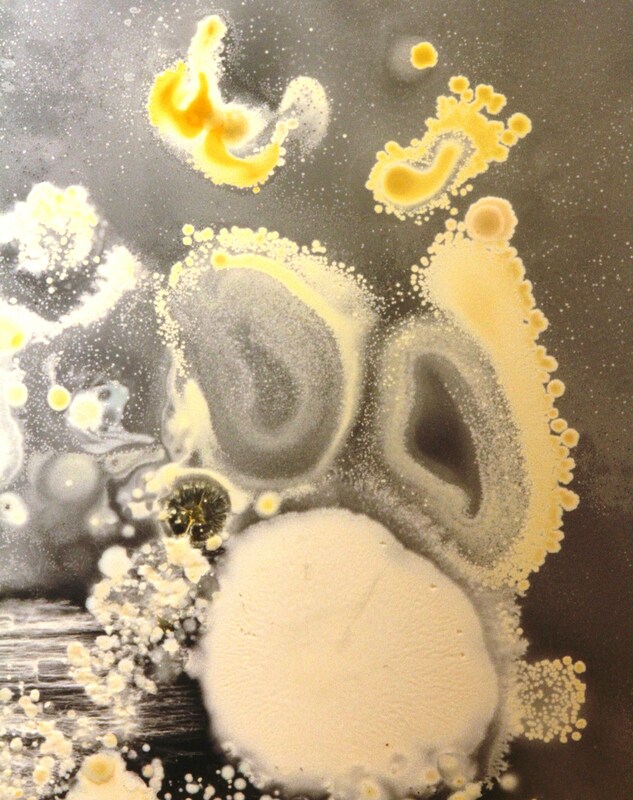 This is the 2nd in a series of posts that highlight some of its acquisitions. 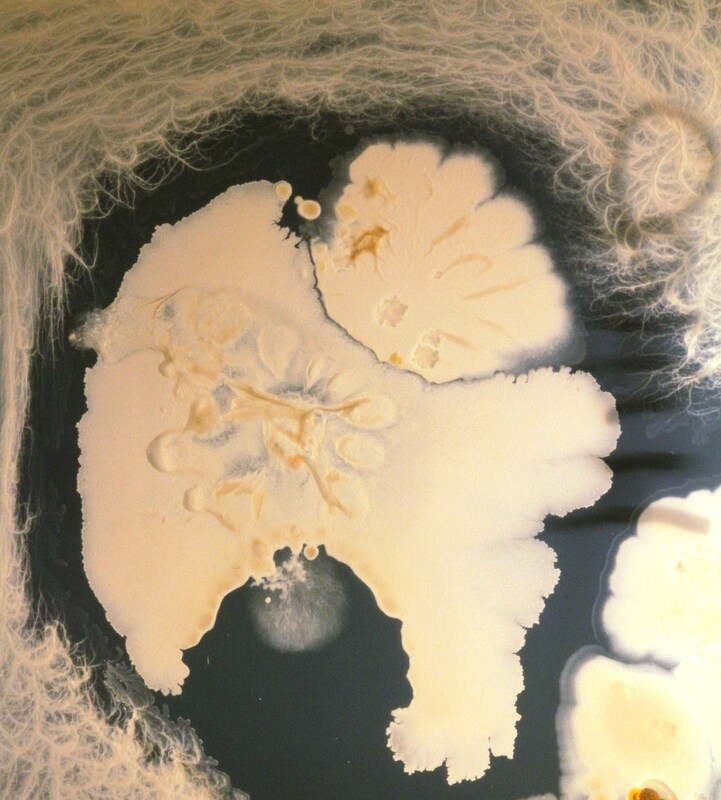 Whilst the collection also features many bacteria, this post draws attention to some of it fungi/moulds.